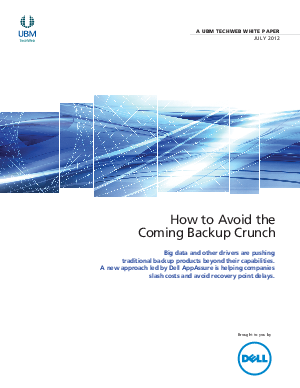 Dell Software » Big Data is Getting Bigger; Is Your Backup Keeping Pace? Many companies today are seeing data growth of 60% or more annually — everything from structured databases and text to enormous multimedia files. In the event of a service failure, your IT will still be under pressure to restore services immediately and completely. Find out what you can do to stay prepared: How to Avoid the Coming Backup Crunch.